The trick is to get the sponge as light and airy as you can by beating the sugar and eggs using an electric whisk for about 5 minutes. Then add your softened butter, margarine or oil to the mixture and keep whisking for another 3 minutes. Stop whisking and seive in the self raising flour, gently folding it in with a metal spoon or spatula if possible. At this stage, do not mix or whisk the mixture at all, just keep folding for at most 2-3 minutes, until the mixture is smooth. For the cream, use 1 large carton of double cream for a small gateau or 2-3 for a larger gateau of 3 layers or more. If you want to add sweetness, add a teaspoon of confectioner’s sugar. Pour the cream into a mixing bowl and whisk until soft peaks form. You’ll know when it’s done, it’ll look a little stiffened but light and creamy. Leave that in the fridge and wash and chop up whatever fruit you want to use in the gateau. Berries look best on a gateau so, strawberries, blueberries, raspberries, blackberries etc etc. Most berries don’t need cutting into halves or quarters as they’re small enough as they are however, strawberries are better cut. So once your sponge is baked, take it out onto a rack to cool for about 20 minutes. Once completely cool, use a chef’s knife or any large flat knife to cut the sponge into 1-2 centimetre thick layers. Again, depending on your recipe and sponge size, you can probably get between 2-4 layers cut out of it, I had 2 sponges in mine. Use a cake board, plate, flat dish, whatever you want to present your gateau on. Place one layer of sponge, smother the cream over it with a large, flat spatula or knife and then generously throw on your fruit, making sure you go around the edges of the sponge. Add a little more cream and then place your next layer of sponge. This is where I stopped with the layers of sponge however, you can add more layers by just repeating the steps. After adding the second layer of sponge, I placed the remainder of strawberries on top and then dusted over the sponge with icing sugar. I then put the rest of the cream into a piping bag and piped little rosettes around the sponge. 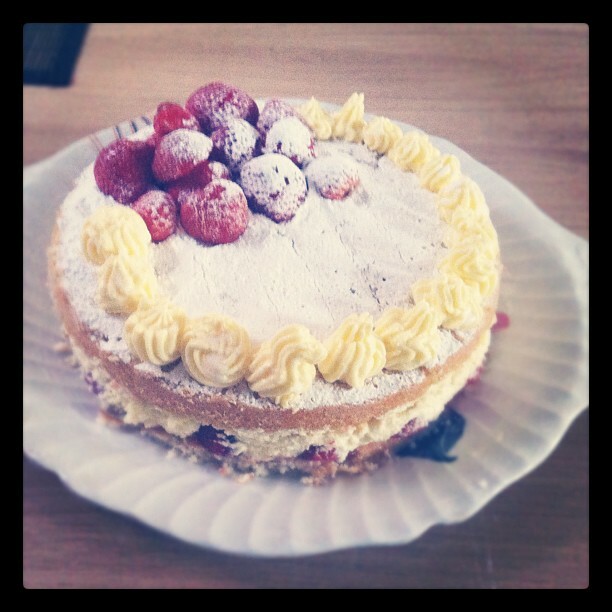 Posted on June 24, 2012 by saritakb	• This entry was posted in Orders, Secrets and Tips and tagged baking, cake order, cakes, french, gateau, light sponge, simple baking, strawberry gateau. Bookmark the permalink. Thank you Sarah! You’re welcome to like and share my blogs.